Beijing -- The United States started on Thursday evening to show its muscles seven days into the track and field competition at the Beijing Olympic Games, sweeping the medals in the men's 400m race. 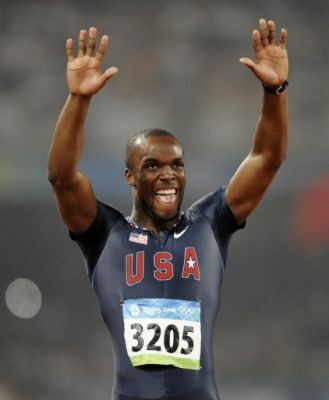 World championship silver medalist LaShawn Merritt, with his personal best 43.75-second Olympic run, toppled the reigning of Olympic and world champion Jeremy Wariner, who had occupied the top places in the lap running for a few years. Merritt said, "You don't become a champion without being mentally and physically tough, and you know what, I showed up and I got it done." The 22-year-old American said, "I set the race up before I even started. I stuck to my game plan. I was to open that stride up and use what I've got. I said I was going to run a personal best because I felt great in the semifinals." Wariner, who particularly chose a pair of shiny silver track shoes in hope for his second Olympic title, used up his energy in final strides and finished in 44.74 seconds, the second place. The confident Wariner, who specially chose himself a pair of shiny silver shoes in the finals, said, "I'm disappointed. If I ran like I did in the semifinals, I think I would have won, but you know, things happen for a reason. I didn't have anything left, I ran the best I could." David Neville dove over the finish line to grab a bronze for Team U.S.A. in 44.80 seconds. The 24-year-old American said, "I had to sacrifice myself for it. Sometimes you have to make a sacrifice to get what you really want." This has been the seventh time that American athletes won the men's 400m gold consecutively at the Olympics.